Apple: iPhone 4S or newer, iPad 3 or newer, iPad mini or newer, and iPod touch (5th generation) or newer. The app requires iOS 9 or higher. (Please note: The iPad 2 will not support Kamigami because it does not support Bluetooth LE). Build instructions are on the Kamigami Robots app, which you can get on the App Store, Google Play, and the Amazon Appstore. To build your robot, open the app, tap the large “connect” button, and follow the prompts. While building, you can follow along with our demonstration videos. Kamigami Robots do not require any extra tools, and are powered by a rechargeable battery. Most children 8+ can build their robot in 1-2 hours, all by themselves! It’s also a great parent-child project, if you build together. The Kamgiami Controller app is available to download for free on the App Store for Apple devices, Google Play for Android devices, and the Amazon Appstore for Fire devices. How Do I Remove a Rivet? Almost anywhere! Kamigami Robots do well inside and outside, and like to run on carpet, hardwood, tile, cement, concrete, asphalt, dirt, wood chips and more. (They don’t like tall grass, or rainstorms). More durable than you think. Your robot can survive table falls and scuffs reasonably well. However, if you throw it off a balcony, it may hurt their body (and their feelings). On a full charge, the robot should last for 30–60 minutes of playtime (it depends on how fast you are running). 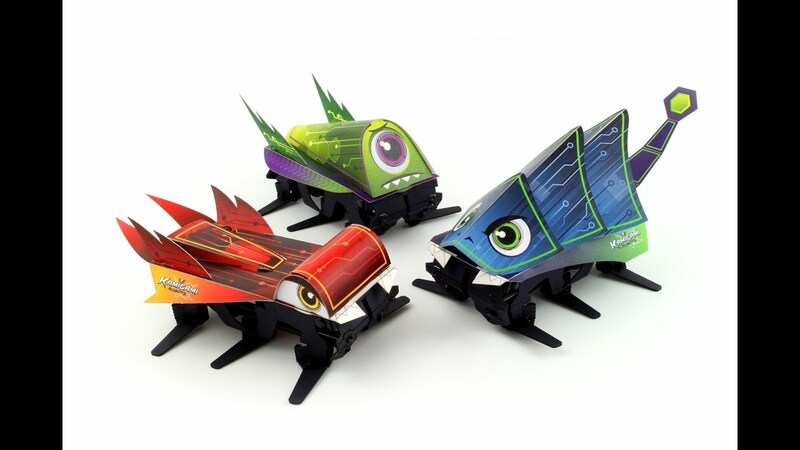 Kamigami Robots are charged with a standard micro-USB cable, which is included in the kit. They can reach a full charge again within 30-45 minutes. Have you successfully connected to the robot? You’ll know your device is connected when the robot’s light changes from red to green. Double check your robot’s hip rails are correctly placed. When your robot is sitting upright, the entire chassis (the bottom body) should look black. If you see any gray facing outwards, it means something is twisted. Make sure the rivets in the legs are not upside down. Make sure the rivets are placed so that the flat, smooth heads touch the ground. If the pointy stems of the rivets are brushing the ground as the robot runs, it can lead to poor performance. If you discover your rivets are backwards, please take them out, then re-insert them (or new rivets), so the smooth side will be on the ground. If you have gone through all the above steps and there still seems to be an issue, contact us at 877-219-8335. Please have your proof of purchase available. If you have an original generation Kamigami (looking something like this), we are still here to support you! Please email us at contact@dashrobotics.com. Be sure to include any relevant pictures, along with the name or number of the original order. Give us a call at 877-219-8335. We’ll be happy to lend a hand! Please have your proof of purchase available when you call.